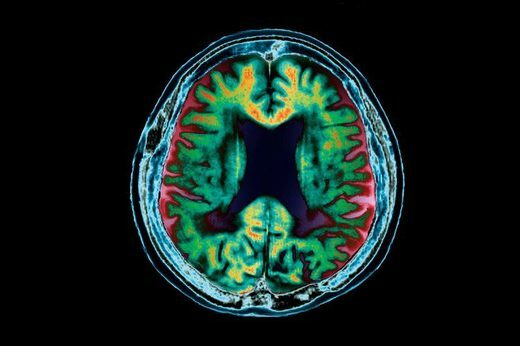 Deep folds and shrinkage appear green and orange in this MRI scan of a patient wtith Alzheimer’s disease. According to the World Health Organization, the total number of people with dementia worldwide in 2015 is estimated at 47.5 million. The total number of new cases of dementia each year worldwide is nearly 7.7 million, implying 1 new case every 4 seconds. The number of people with dementia is expected to increase to 75.6 million in 2030 and 135.5 million in 2050. These figures are almost twice the rate of projected population growth over that time period. In the United States, approximately 6 million American adults have Alzheimer’s disease or mild cognitive impairment. The estimate forecasts that these numbers will more than double to 15 million by 2060. These estimates include people with biomarkers or other evidence of possible preclinical Alzheimer’s disease, but who do not have impairment or Alzheimer’s dementia. People with such signs of preclinical disease are at increased risk to develop Alzheimer’s dementia. We are led to believe that Alzheimer’s disease (AD) has no cure or there is no possibility of halting the cognitive decline. At best, mainstream treatment just slows down the progression of the disease. As a rule, the person deteriorates beyond recognition throughout the remaining years of their life while hopeless caregivers get burned out. For this reason, I was pleasantly surprised when Mark Sisson wrote recently about a study which was published in Aging (2014) by Dale E. Bredesen. The study revealed incredible results that mainstream media outlets failed to cover. The 10 participants of the study started from very serious deficits including memory impairment from Alzheimer’s, amnesiac cognitive impairment, and/or subjective cognitive decline. After following a comprehensive and personalized therapeutic program based on the underlying pathogenesis of Alzheimer’s disease, nine of the ten patients showed subjective or objective improvements in cognitive function and performance within 3-6 months. One failure was a person with late-stage Alzheimer’s disease. Of the six patients who’d had to stop working due to their cognitive decline, all six were able to return to work. In a 2.5 year followup, the patients had sustained and even improved on their results. Not bad at all considering how mainstream protocols have little or nothing to offer to AD patients. Let’s analyze what each subject did in the study and why it worked to reverse cognitive decline. Insulin is the key that fits in the lock of the body’s cells – it opens the doors for the sugar to get into the cells (and out of the bloodstream) in order to be burned. This process is referred to as glucose uptake. In AD there is a fuel shortage in the brain – a reduction in the rate of glucose metabolized by the brain. In some, the reduction has been found to be 45 percent and is always localized to areas of the brain involved with learning and memory. There is a glucose-uptake impairment related to insulin resistance. In fact, AD is also known as “type 3 diabetes” since insulin resistance or a deficiency of working insulin in the brain are responsible for cognitive impairment and AD. A marker of AD is the presence of amyloid-beta (Aβ) plaques, a build up of protein material which prevents neurons from working properly. To keep the brain clear you need a certain enzyme to break down these proteins. But your brain also uses the same enzyme to clear out insulin. In fact, it’s called “insulin-degrading enzyme” or IDE. If you have insulin resistance, IDE is too busy clearing out insulin and has no time to break down amyloid-beta. Ketosis is a state in which the body is burning ketones as its main source of fuel. Ketones are produced when the body starts using fat instead of carbohydrates for its main source of energy. Some fats are converted to ketone bodies to be burned preferentially by tissues like the brain and nervous system (which can’t burn fat) while other tissues burn the fat directly. 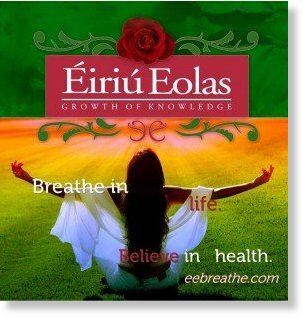 I highly recommend Éiriú Eolas (EE for short) – a program of breathing techniques which grew out of research conducted by the Quantum Future Group. Central to this program is stimulation of the vagus nerve, which activates the calm-inducing parasympathetic system – a powerful anti-inflammatory system in our bodies. The combination of specific rhythms for voluntary breath control, conscious inhalation, retention and exhalation, in conjunction with meditation and ‘belly-breathing’ with correct use of the diaphragm, helps to increase levels of the anti-stress hormones GABA (our natural Valium), melatonin (our pineal gland hormone), and serotonin (our ‘happy mood’ brain chemical), whereas levels of the stress hormones cortisol and norepinephrine are decreased. The Éiriú Eolas program uses what is called ‘Pipe Breathing’ as the key to instant stress reduction and control. Pipe Breathing stimulates the vagus nerve, the heart of the parasympathetic nervous system – the body’s own ‘anti-stress system’. The vagus nerve is your calming and relaxing nerve which goes from your brain down to your abdomen, dividing into multiple branches that reach your throat, your heart, and all your viscera. It is also called ‘the wanderer’, as it wanders throughout your body. When you take deep breaths in specific rhythm sets and meditate with Éiriu Eolas, the nerve is activated and it releases acetylcholine, which reduces the production of inflammatory molecules like cytokines that are linked to every known disease. For instance, brain inflammation is linked to every known mood, behavior, attention, memory, or degenerative disease. The vagus nerve enhances neurogenesis (the creation of brain tissue) by increasing BDNF output – the “super-fertilizer” of brain cells. It helps repair brain tissue, but also helps with tissue regeneration throughout your body. BDNF plays an important role in neuronal plasticity, which is essential for learning, thinking and higher levels of brain function. Practicing Éiriú Eolas will therefore kick-start or improve neurogenesis and neuroplasticity, processes that are essential for maintenance of brain functions as we age, but also for recovery from trauma, emotional adaptation, and learning. Melatonin is a hormone made in the pineal gland which regulates the circadian rhythm. When the retina in the eyes stop sensing as much blue wavelength light, the suprachiasmatic nucleus – a region in the brain – senses this and induces the pineal gland to begin making melatonin. For more information, don’t miss this SOTT focus on the subject: Is Artificial Light at Night Making You and Your Kids Fat & Sick? Vitamin D insufficiency among the elderly is highly correlated with accelerated cognitive decline and impaired performance, particularly memory loss associated with Alzheimer’s disease and dementia. Individuals with low vitamin D decline at a rate three times faster than those with adequate vitamin D levels. These hormones have their role in excess weight, lack of energy, aging, and illness. Hormone imbalances can cause metabolic problems and lead to non-degenerative forms of dementia. Balancing your hormones can cure underlying health issues and result in restored sleep, greater energy, improved mood, easy weight loss, increased productivity, and many more benefits. For more information, check out Dr. Sara Gottfried’s The Hormone Cure. Medium Chain Triglycerides (MCTs), found in coconut oil, boost cognitive function in AD patients – and just after a single 40 ml dose! Although not part of the original study, I’m including it here due to its amazing results in AD patients. Photobiomodulation is a term referring to light’s ability to modulate key biological processes at a cellular or genetic level. 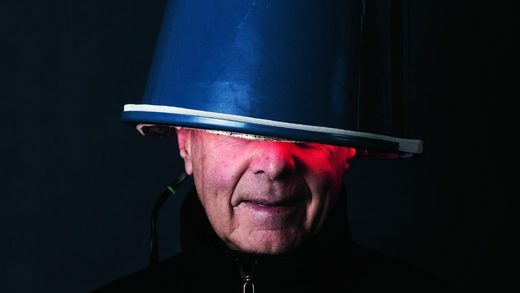 Light therapy, using red and near-­infra-red light, has strong neuroprotective effects. For more information about the devices that people are using, including homemade ones, see Let there be light – Photobiomodulation. © Chris Crerar. Homemade light therapy device. Don’t wait until it is too late. You don’t have to lose your mind. Improving your cognitive performance may be a matter of modifying your lifestyle with simple steps that will fulfill your life.